Sunday, June 17, 1888 As warm certain, & pleasant. About as usual with our folks. Ellery at service A.M. & Charlotte at s-school also with children. Ellery had little ones with him for short walk after tea, reading in Bible in eve. 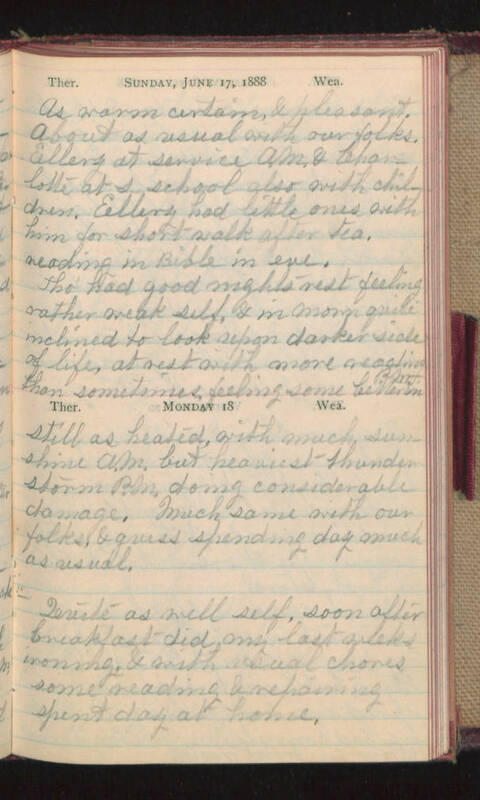 Tho' had good nights rest feeling rather weak self, & in morn quite inclined to look upon darker side of life, at rest with more reading than sometimes, feeling some better in P.M. Monday 18 still as heated, with much sunshine A.M. but heaviest thunder storm P.M. doing considerable damage. Much same with our folks, & guess spending day much as usual. Quite as well self, soon after breakfast did my last weeks ironing, & with usual chores some reading & repairing spent day at home.